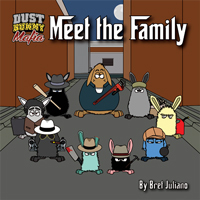 Next weekend, I’ll be promoting the Dust Bunny Mafia at Flip Con, Forest Park library’s annual mini comic con. Our annual library Comic Con features tables and activities all afternoon including author signings, costumed characters, photo booths and games. Costumes are welcome!